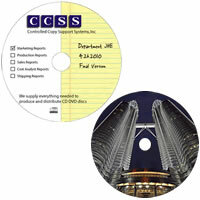 Custom Printed CD DVD Media : CD/DVD Supplies & Services, CCSS Inc. Custom Printed CD-R or DVD-R Media. InkJet Printed, Silk Screen, Digital, Thermal.